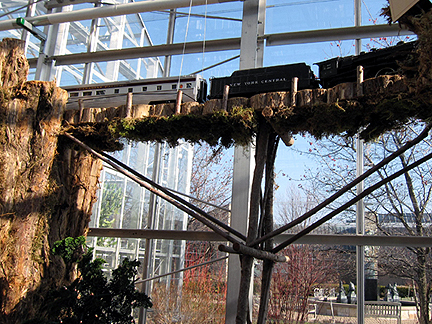 My friend Amy and I enjoyed a trip to Frederik Meijer Gardens & Sculpture Park in Grand Rapids on November 22. It was an unseasonably warm day and we enjoyed both indoor and outdoor attractions. As part of Christmas and Holiday Traditions Around the World, Meijer has Christmas trees decorated in the themes of over 40 countries. Swedish-inspired Christmas tree. 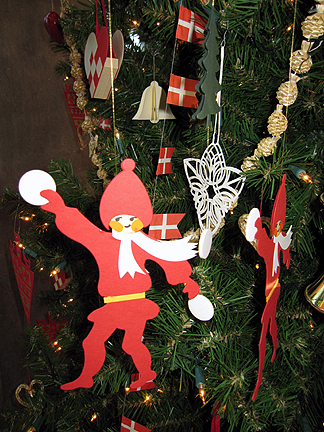 I have some wonderful Swedish straw garlands and a lovely wood star tree topper. They're unfortunately not useful since I started using my Norfolk Island pines as my Christmas trees. Dutch tree, close up. 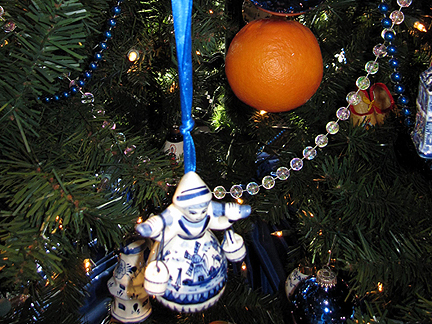 I love the blue and white Delft ornaments. The Victorian Christmas tree, protected in a glass case. 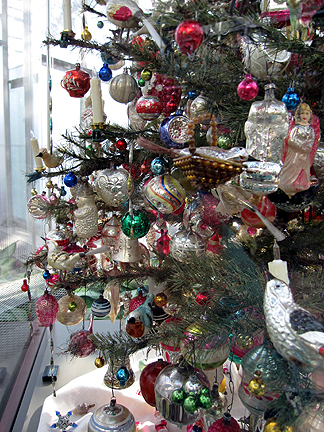 I love these ornaments and have a few really old clip birds myself. Finnish tree, close up. 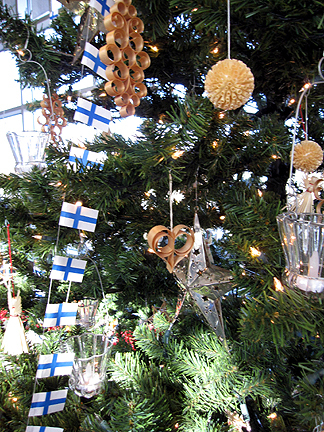 Jaana (my long-time friend in Lappeenranta), do you have any decorations like these on your tree? Danish tree, close up. Because my mom is from Hamburg in northern Germany, not far from Denmark, I grew up with Danish furniture and Danish Christmas tree decorations, both of which I still love. I don't want to give the impression that trees were only from Western Europe, those are just ones I have a special connection with. 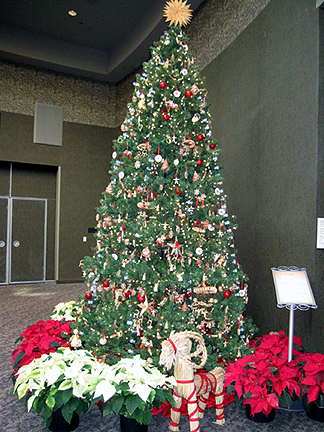 There were also trees decorated in Asian, African, Australian, Indian, Middle Eastern, and Eastern European themes. 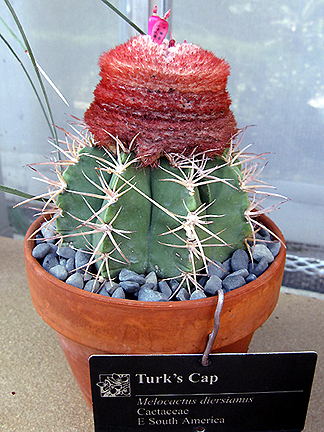 We also enjoyed the conservatories and other indoor displays. 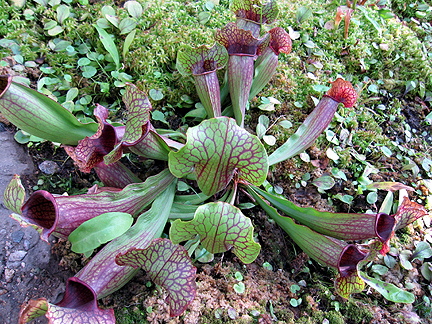 I love pitcher plants! I've seen them in bogs outside, and it's nice seeing them close up in the conservatory. I love the model railway! Choo choo! I love Yucca close up. 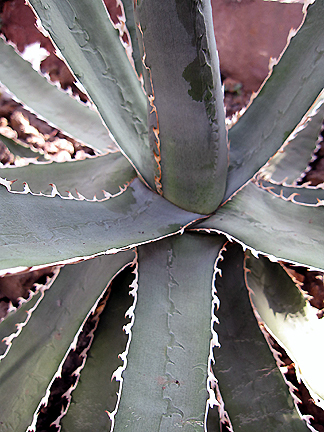 The leaves are curled up before they open, and the edges imprint themselves on the opened leaf. Noogie! That's all that needs to be said about this cutie. 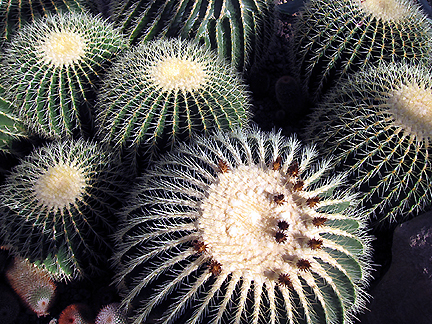 I love the textures of the barrel cactus. 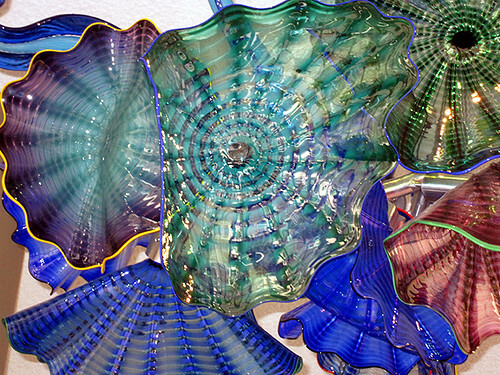 Well, it's no secret I love Chihuly's glass art. It took me a little while to warm up to Guilded Champagne Gardens Chandelier because I'm used to more vibrant colors in his work. But the gold and clear glass really worked in this light-filled nook and I really appreciated the color variations, which emerged once you looked at it for a while. The volunteer in the library tipped us off to Lena's Garden in the cafe, which was installed in May. 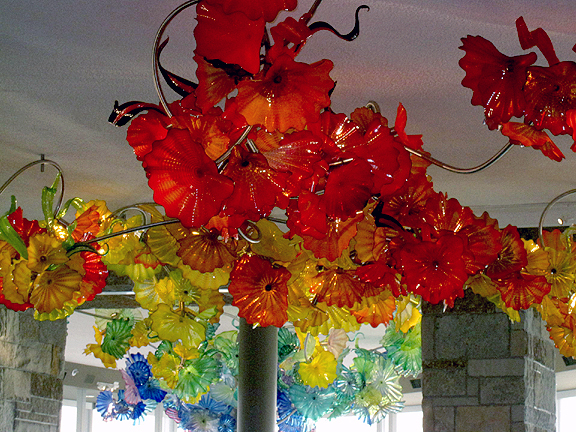 This is a wonderfully large installation in a riot of color. 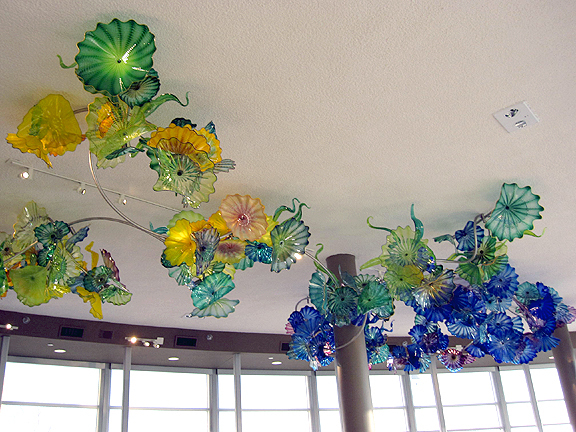 Many Persians and sea forms were installed on the ceiling. The colors slowly change from red-oranges to yellows, greens, blues, and purples. My public speaking experience has made me unafraid to pardon me, excuse me, stand between tables where people are enjoying a respite and take photos in a hundred different angles! 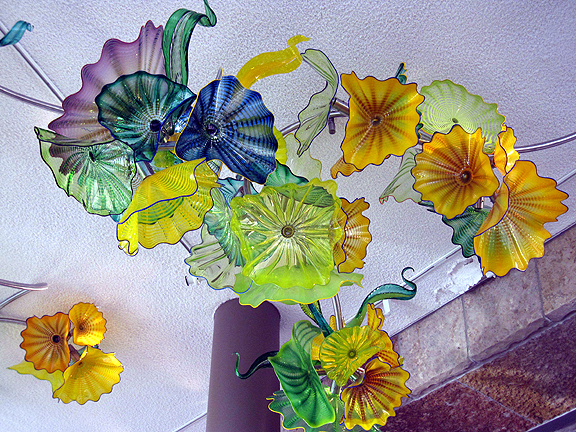 You already know how much I love Chihuly, so I'll just let you look at the photos. It was also a wonderful day for a walk outside. 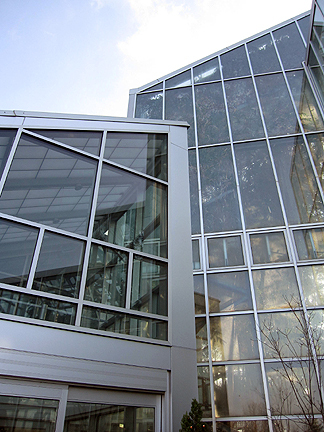 Because it was so unseasonably warm, it wasn't hard to leave the glass house. 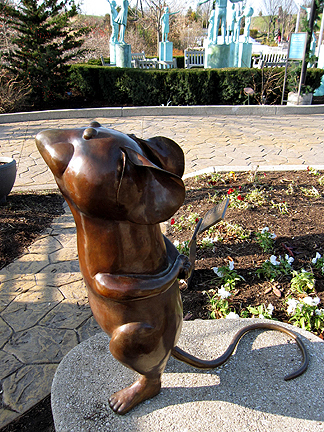 A sweet little bronze mouse in the children's garden contemplates life, the universe, everything. 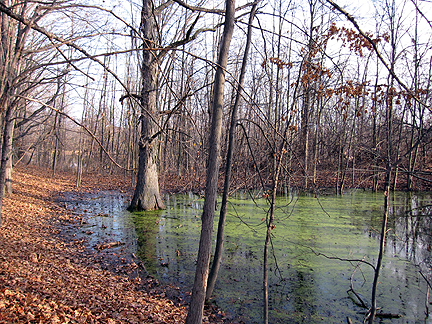 A swamp on the way to Michigan's Farm Garden. We also enjoyed all the sculptures in the Sculpture Park. 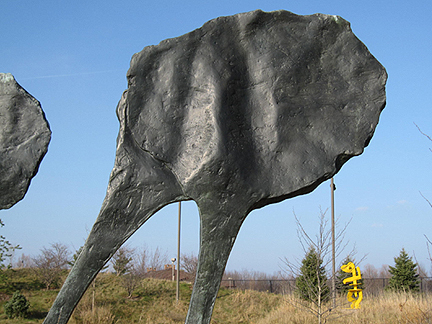 Elisabeth Frink, Mirage I and Mirage II, with Keith Haring, Julia, in the background. I find the former both intriguing and disconcerting. I like the latter full-stop. 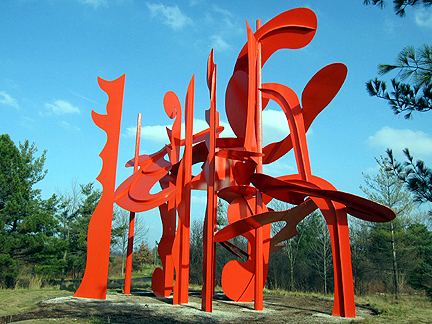 Alexander Liberman, Aria. I was fascinated by how multifaceted this sculpture is, depending on the angle and distance from which you view it. At first I thought it was red (and a Calder), but it's orange. ... and from a distance, surrounded by late fall colors. It always looks nice. I love this piece! 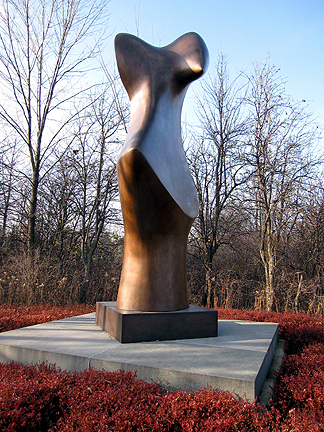 Henry Moore, Bronze Form. I love the fall feel in the colors and textures of this view. Because I became familiar with the work of Barbara Hepworth before that of Henry Moore, I always think Moore sculptures are Hepworth sculptures, and I think most people have the opposite reaction. Incidentally, we somehow managed to miss the Hepworth at Meijer! 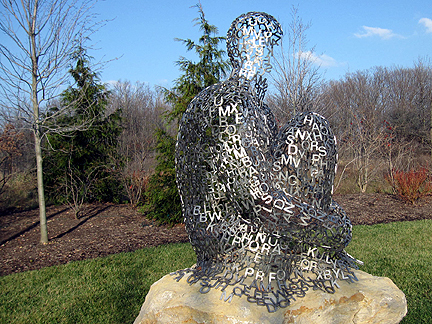 Jaume Plensa, I, You, She or He... I feel like a number... Oh, wait, those are letters! There were several similar pieces in this grouping. I really like the concept. I like this broad view, with Jonathan Borofsky's Male/Female to the left. 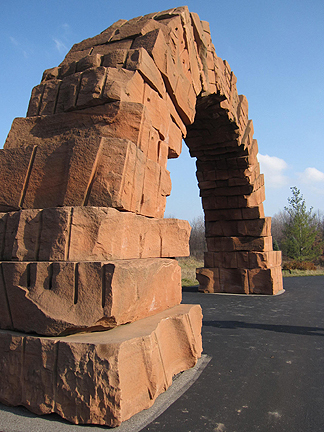 Andy Goldsworthy, Grand Rapids Arch. 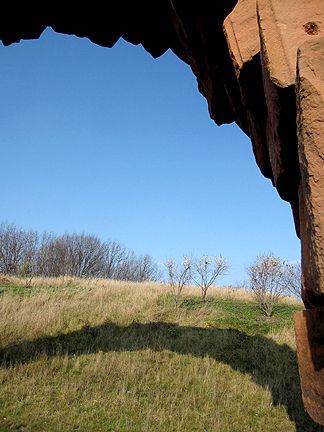 I love the sandstone and the shape of this arch. It uses no mortar and is held together only by physics. I like to walk all around sculptures and appreciate all views. Nina Akamu, The American Horse. Not my particular cup of tea, but I appreciate the artistry and immensity of this piece. And the wreath is a nice, seasonal touch. 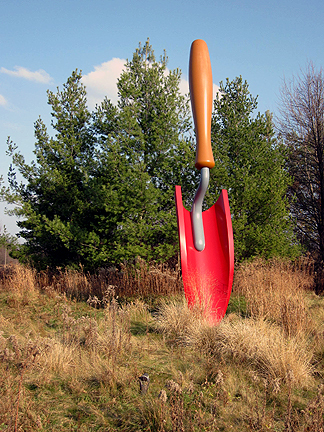 Claes Oldenburg and Coosje van Bruggen, Plantoir. 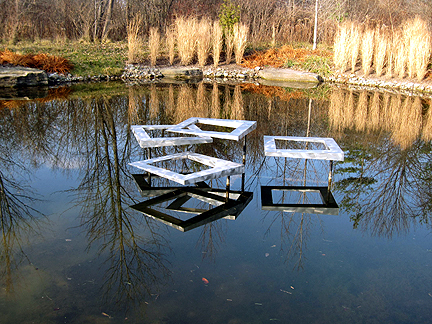 You would think this would be my favorite sculpture at Meijer Gardens, and it very nearly is. I've also been lucky to see a similar sculpture by Oldenburg, Trowel (it's blue), at the Kröller-Müller Museum in The Netherlands. George Rickey, Four Open Squares Horizontal Gyratory — Tapered. I love how this piece fit into its surroundings. I bet it's stunning in other seasons, too. 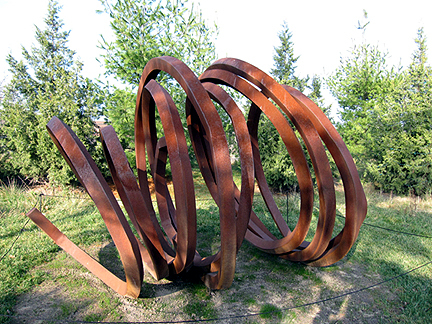 Bernar Venet, Two Indeterminate Lines. A very fun piece, temptingly interactive. Louise Nevelson, Atmosphere and Environment XI. I thought this fit really well into the scene. If you're still with me, good! 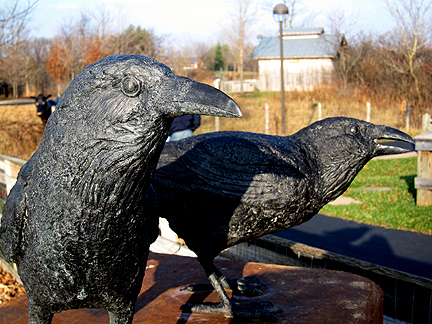 I have a special prize waiting for the person who can a) guess what my favorite sculpture at Meijer is (not counting Chihuly, as that would be too easy) and b) identify where the crow quote comes from. If more than one person gets the correct answers, I'll do a drawing. Have fun! Also check out Our Little Acre's entry about her visit to Meijer Gardens in June. 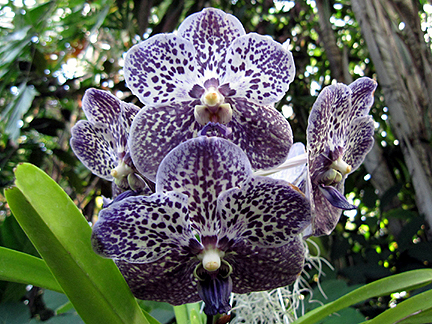 Special thanks to Amy Sawade of Meijer Gardens for IDs and verification assistance! What a beautiful place! The succulent wreath at the top is pretty amazing! I enjoyed this visit from the beautiful succulent wreath to the very end. I could have looked at more sculptures. Mybe your favorite is the one you said might be interactive. 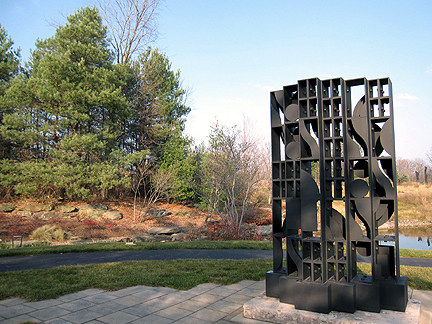 Or maybe the sculpture with the words/letters. I like that. I am glad you gave us an up close look at the letters. I like the big horse. It is HUGE. 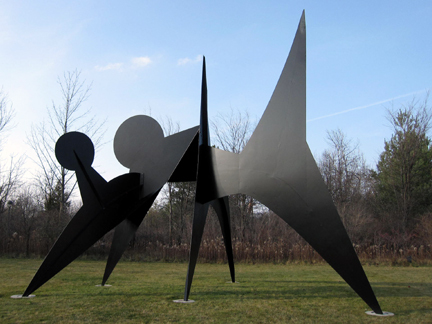 It always amazes me to see these huge sculptures in a garden. Thanks so much for the tour. It was really nice seeing it in fall as well as Kylee's summer photos. What a wonderful place to visit.. 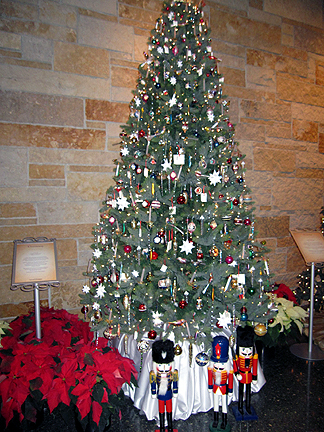 I am really amazed about the beautiful decorated Christmas trees, sculptures and ornaments. Monica, This was a wonderful post. 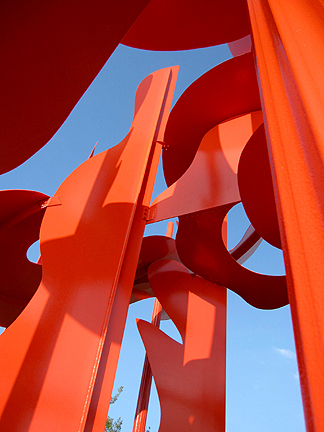 I loved the sculptures~~Especially Bernar Venet's Two Indeterminate Lines. 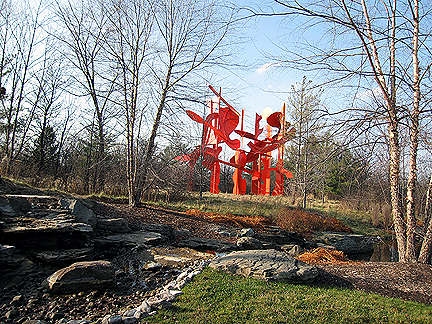 There is something delightful about sculpture gardens...We have two in Tennessee that I thoroughly enjoy. I have no idea where the quote originated...I think the Mouse is your sweet favorite! ps Thank you for the snail mail...It came this weekend and I meant to email you! We've had trouble with slow and missing mail recently. That was SO very thoughtful of you! The orange Aria and Nature Trail Stuffed Animals by Arrogant Worms. The site kicked me offline on the search for the quote. Full disclosure. Thanks for this thorough post, Monica. 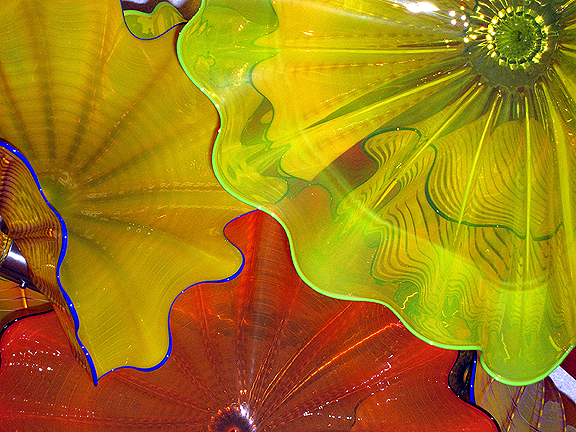 I can never get enough Chihuly and love your header! Wow, what a beautiful place. Thanks for the tour Monica. I have to visit for myself one of these days. I'm blown away by the sculptures. btw, do you know how to make animated gifs? When I took that pic in your header I took two more after it. When I was looking through the files I noticed that if you flip through them rapidly it looks like you're talking.If you know how to make an animated gif I can pass the two pics on, so you can build it. I love it! I just knew this place would be fabulous at any time of the year and your post proves it. I want to go back next spring. We visited nearby nurseries (towards Holland/Zeeland) and I'd like to do that again, too. Thanks for providing an ID for me for one of my photos. :-) We took the shuttle tour of the sculpture park, so I wasn't able to get up close to too many sculptures. I would have walked, but we were really short on time and my mom was having some hip pain. The Christmas trees are beautiful! Your favorite sculpture? Hmmm... I'm going to guess Aria! Oops. Forgot to add that the crow quote is from "Mounted Animal Nature Trail" by Arrogant Worms. 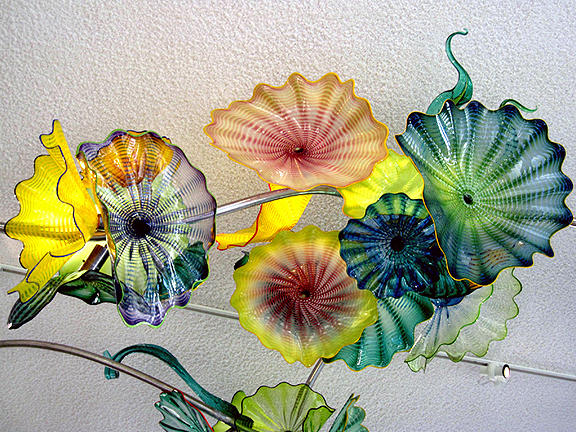 That glasswork is just amazing - am I right in remembering you did a post on Chihuly a while ago? Thrilled with delight by my findings, I come to report back my success - only to find that I've been pipped at the post by Kylee!!! Oh my gosh Monica, what an amazing place! I love Chihuly - Meijer's display is just delicious. The sculptures are fantastic. I'm not sure I could pick a favorite - they're all wonderful, and there's such an interesting variety. It's so cool that you and Kylee both did posts on Meijer - it was great seeing it in two different seasons, and seeing both your perspectives on your visits. Thanks for taking us on this wonderful tour, Monica! The Christmas tree display would have been enough to get me to visit, but having nice enough weather to see all the rest of Meijer Gardens was an added bonus. I visited Meijer Gardens several years ago with Husband and Daughter--they were humoring me:)--and was enthralled by the place. I didn't know you were such an art connoisseur! 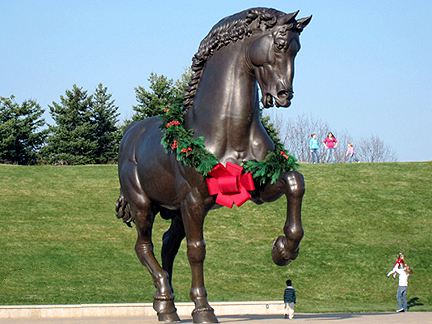 I'm not really into modern sculpture, so ironically, my favorite piece was "The American Horse." It's quite impressive. But I would have loved to have seen more of Chihuly's work; I wish you could have been with me last year in Phoenix to see that display. 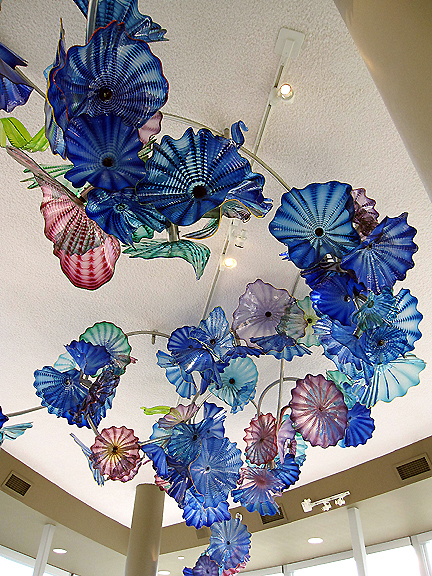 It's amazing how he creates works that seem to fit into each setting--love the flowers on the ceiling here! Love your new header! Have I said the word "love" enough? :) The two of you look like you're having a great time, and seeing all these photos, I understand why. Thanks for sharing all of these! I love the different trees! What unique ornaments. Makes me want to make our tree more wordly this year. What a great tour, Monica. I loved the riot of color in Lena's Garden. 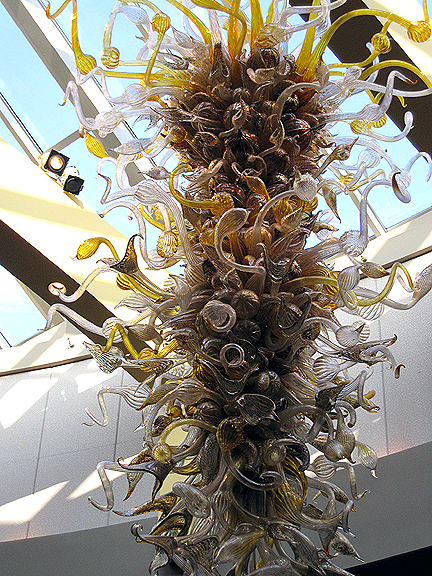 I love Chihuly's glass too. I enjoyed all your featured sculptures as well as the featured Christmas trees. I am not sure which I loved the most, but I do know I would love to have a bronze mouse in my garden! The American Horse reminds me of the horse sculptures all around town in Lubbock, Texas, although they are all different colors and somewhat disconcerting to see a blue horse, or red, etc. I always crack myself up having to comment that it is a horse of a different color (it doesn't take much to amuse me!). I also love the Two Indeterminate Lines--reminds me of some of the slinkys I have had in my childhood. What is your favorite...hmmmmmmm. I think it is between Alexander Liberman's, Aria and Henry Moore's Bronze Form. I am going to say the Aria--it looked positively lyrical to me. 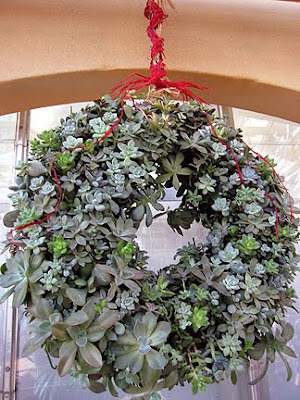 My favorite is that succulent wreath too. The subtle differences in colors and shapes are beautiful. 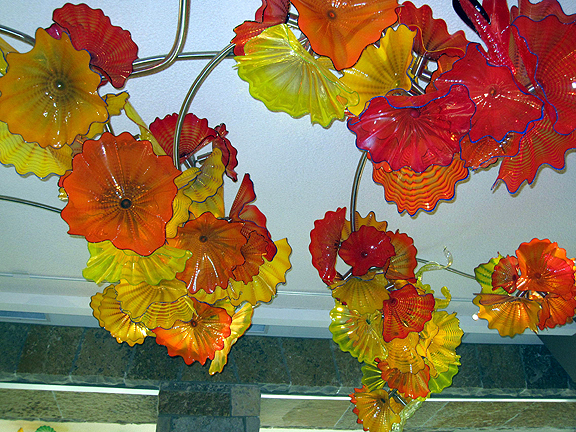 Viewing Chihuly's works always lifts my spirits. Those amazing colors and the graceful shapes he creates...amazing. 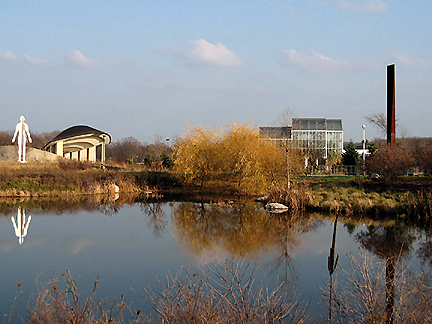 I love Fred Meijer Gardens. I did a blog post on it over on my blog a while back. When we went this last April it was pouring rain so we weren't able to wander the outdoor areas. Also they didn't have any of the Chihuly glass art. They had an exhibit of sculptures made of hands, which we weren't impressed with. Here is the link if you want to see my macro photos of the Carnivorous plants. I am going to guess Aria and then the quote is from the song Mounted Animal Nature Trail by Arrogant Worms. There are some interesting lyrics to that song. LOL Had never heard it until today. The ceiling flowers or whatever they are - absolutely stunning. I think I would get a crick in my neck trying to see them all! I never knew the Meijer gardens existed before you mentioned it, but I'm absolutely ready to go. 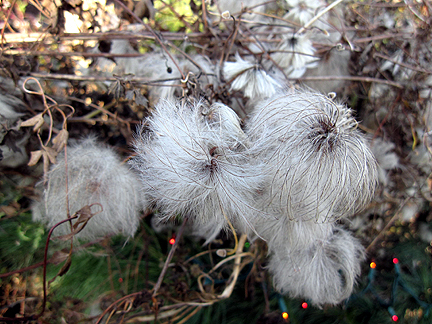 Monica, I visited Meijer Gardens a couple of times in the last few years (and even blogged about it here: http://www.diggrowcompostblog.com/2009/01/art-in-garden.html). It looks like there are some new sculptures since I've been there. I'll bet you loved all those cool ornaments on the trees, didn't you? An internet search says the crows' line is from Arrogant Worms' "Mounted Animal Nature Trails". And my guess for your favorite sculpture, hmm, would be Male/Female. At least it was one of my faves! I love the Delft ornaments too. 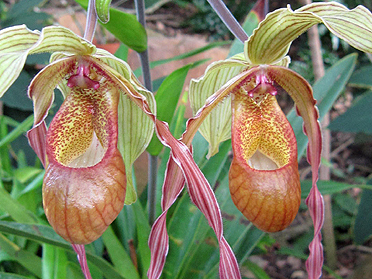 Those Lady's Slippers are amazing!! They really do look like slippers. OH MY GOODNESS. I have been missing all this! The trees, the gorgeous coloured glass, all the fab sculptures, very happy to have seen that post. You're going on my blog list right now. So jealous too though. I'm too late to guess your fave sculpture for the prize - I wonder if I would have guessed correctly? I too like the orange one, and the giant trowel. I did sculpture for my art degree, and at that youthful age did not really appreciate it as much as I do now.